GunLink had a chance to stop by the Slide Fire Solutions demonstration booth and check out some of their offerings during the SHOT Show Media Day at the Range, including the original OGR and the updated models of stocks for AR-15 rifles as well as the new SSAK-47 XRS stocks for AK-47 rifles. 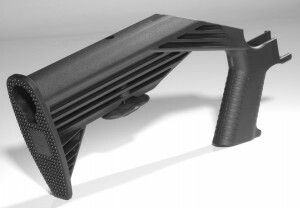 Slide Fire Solutions declares that they are not the first company to engineer bump fire technology, but they found a way to take it to the next level. If you have never heard of the technique of “bump firing” a rifle, the basic idea is to allow a semi-automatic firearm to fire multiple shots in rapid succession, often with rates of fire approaching those of automatic rifles. This is achieved when the shooter holds their trigger finger in a stationary position (often by hooking it into their belt loop) and uses their support hand to apply constant forward pressure by pulling the rifle forend away from them. This motion causes the trigger to press forward into the shooter’s stationary trigger finger, thus firing the rifle. After firing, recoil causes the rifle to move rearward before the constant forward pressure brings the trigger back into contact with the trigger finger and starts the process over. Although this procedure allows for fast rates of fire, it does not convert the firearm to automatic operation because each shot is caused by a single trigger pull. Each Slide Fire accessory kit even includes a copy of the BATFE letter certifying that it is not a machine gun. During our visit, I had a chance to try out an AR-15 equipped with a Slide Fire right-handed stock. 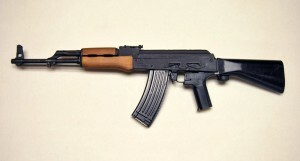 The first thing to make note of is that, even with the aftermarket stock attached, the firearm can be operated exactly as it normally would be by using the latch on the bottom of the stock to lock it in the rearward position. Operating the firearm in “Slide Fire mode” is very similar in basic mechanics to normal operation: the rifle is held and shouldered as usual; the difference comes in trigger finger placement. As the shooter puts their finger through the trigger guard, they rest it on a small shelf on the far side of the trigger (this is where the left- versus right-handed units differ). Once ready to fire, the user turns off the safety and pulls forward on the hand guard to bring the trigger into contact with their finger and the bump firing (or, as the Slide Fire folks call it, “controlled rapid fire”) commences. Slide Fire product materials estimate both the AR-15 and AK-47 variants to produce rates of fire between 400 and 800 rounds per second. I didn’t time my rounds fired, but I can tell you that they were coming out FAST! Initially, I found the movement required to make the rifle fire in “Slide Fire mode” awkward but, even as soon as the second magazine, I began to get used to it. Comments from company personnel on hand varied from claiming that they could put an entire magazine into a target the size of a golf ball to the size of a grapefruit. Despite their statements about the forward pressure required to discharge each round naturally lending itself to better control and less muzzle rise, the muzzle still seemed to climb quickly, although this may be another thing that experience and technique with the system would take care of. This muzzle climb also quickly made it clear that my initial concerns about the eye relief distance between the stock in the forward position and the rearward position a moot issue. This same movement, however, also meant that, using the same cheek weld in semi-auto mode and Slide Fire mode, the reciprocating action caused the optics to come back and contact my shooting glasses. This clearly wouldn’t be an issue with iron sights or shorter optics. The price of the Slide Fire accessory kits (close to $300 for the AK version and over $350 for the AR version) might cause sticker shock for some. However, considering the amount of fun someone could have with one of these and the fact that a tax stamp alone for a full-auto rifle is $200 (not to mention the relatively high price of the rifle itself), this price could be a bargain for someone who wants to start burning through piles of ammo without waiting months for BATFE approval of an NFA weapon.